MN350 Rapid Action Team at the Minnesota Soil and Water Conservation Society’s annual convention, responding to Enbridge Line 3. I got a call Monday morning from friend and long-time pipeline resister Marty Cobenais, who is enrolled at Red Lake. He was attending the Minnesota Association of Soil and Water Conservation Districts’ annual convention and trade show in Bloomington. Enbridge was tabling the event, he said. Company reps were talking about Line 3’s so-called “benefits” and conveniently leaving out the litany of harms: climate damage, impacts on treaty rights, oil spill risks, etc. MN350 connected me with a few people interested in doing a small action. I met Paige Carlson and Dan Forke at the Double Tree by Hilton. 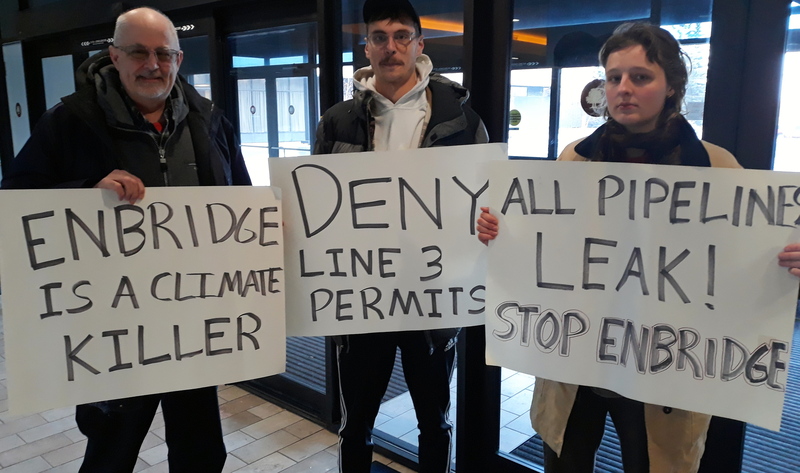 During the convention’s afternoon coffee break, we walked though the trade show’s tabling area with a few hand-made signs, such as “Enbridge is a Climate Killer.” We were there probably five minutes. We said nothing. We weren’t disruptive. We were a silent witness against this deeply flawed project. Marty let us know that this simple and brief act got some buzz at the convention. Enbridge’s story got challenged. A win. The idea for Rapid Action Teams grew out of M350’s conversations with people at indigenous-led camps opposing Line 3 up north. MN350 staff asked them what support they wanted. The response they got: Don’t come north, at least not yet. Instead, do things where you live to continue pressure on Line 3 in high-visibility, low-risk ways. MN350’s Rapid Action Team meets at the MN350 offices, 2104 Stevens Ave, Minneapolis. All are welcome. The meeting times are still in flux. Email Mary Breen at mary@mn350.org for more information.